We explain the a priori-a posteriori distinction, analytic-synthetic distinction, necessary-contingent distinction and other logic-based terms. In doing this we will define Kant’s analytic a posteriori, synthetic a posteriori, analytic a priori, and synthetic a priori from his Critique of Pure Reason (in which he defines many terms and rules of propositional logic; that is, terms and rules pertaining to the validity of statements and arguments). The above terms may sound intimidating at first, but the gist is simple. They are all terms used by Immanuel Kant that speak to whether a statement (a judgement or proposition) is based on empirical data (facts based on experience), rationalized ideas (facts based on ideas), or a mix of the two. This concept can be illustrated in a number of ways, including by placing terms into two distinct categories (rational and empirical) like we do below. What do a priori and a posteriori mean? a priori means “prior to experience” (“pure” “formal” imagination and reason; rationalization not based on experience), and a posteriori means “after experience” (concepts we get from observation via our senses; based on empirical experience). All our terms speak to one of these two categories or a mix, as ultimately everything we conceptualize is either the observed properties of an object, an imagined idea, or a mix. Rationalism Vs Empiricism. This video works as a quick overview of our subject. What it lacks in detail it makes up for by offering a quick and easy visual of our overarching subject. Of course, with that two prong distinction in mind, we can note that each set of terms and each term itself has its own important and meaningful definition (as do combinations of those terms). TIP: The trick to understanding Kant is understanding what these terms mean in isolation and how they relate to each other and to the study of human knowledge. If you get the two-pronged fork, and you get the distinctions below, you get the basis of Kant’s theory of epistemology. Each of the terms in the above fork can actually be considered as a pair where we consider the A Priori and A Posteriori, the Analytic and Synthetic, and the Necessary and Contingent. Each pair speaks to different aspects of “what we can know” about statements (AKA logical judgements or propositions): The necessary and contingent speak to reality itself, the a priori and a posteriori speak to human knowledge and what we can know, and the analytic and synthetic speak to the language we use. When we consider the nature of a statement/claim/judgement/proposition, we must consider “reality as it is,” “what we can know about reality as humans and consider knowledge,” and “the language we use to express knowledge about reality.” After-all, there is a difference between reality itself, how we conceptualize it, and how we communicate what we know about it. Considering all three aspects of “what we can know” at once allows us to examine all aspects of a proposition, and shows us how we can have useful rational knowledge about the empirical world. With that covered, it’ll help to give specific definitions to each set of terms. So let’s do that now. TIP: A proposition is a statement containing at least two terms rational and/or empirical terms conjoined by qualifier like “and,” “or,” “if…then,” or, “not.” Humans conceptualize reality and rational ideas, and then use propositions (or in common language statements) to speak about that. Thus, Kant’s focus is on dealing with human knowledge in the proposition form, and then relating that back to reality itself using logic and reason. 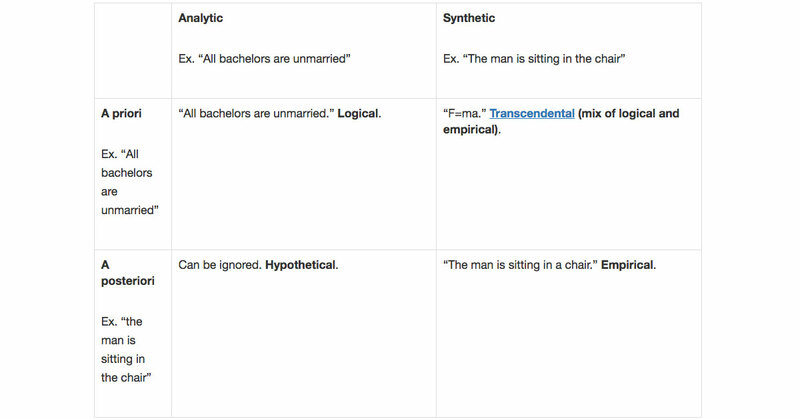 The analytic – synthetic distinction: Analytic statements can be proven true by analyzing their terms (they are tautological), meanwhile synthetic statements cannot be proven true by analyzing their terms. The necessary – contingent distinction: Necessary statements are necessarily true in all cases, meanwhile contingent statements depend on more information (they are conditional). The a priori – a posteriori distinction: A priori statements do not rely upon direct experience (they are rationalized), meanwhile a posteriori statements do rely on direct experience (they are empirical). Then combinations of the above terms speak to different types of rational, empirical, or mixed propositions (for example, we can consider a contingent synthetic a priori, an a priori statement that does not rely on experience, that is synthetic and thus can’t be shown true based on its terms alone, and is contingent and thus depends on more information to determine its truth-value). Ex. “All bachelors are unmarried” Analytic a priori are propositions not based on experience that can be shown to be true by their terms alone. “All bachelors are unmarried.” Logical. Synthetic a priori are propositions not based on experience that can’t be shown to be true by their terms alone. “F=ma” Transcendental (mix of logical and empirical). A posteriori (a statement that does rely upon experience; therefore logically contingent; related to empiricism and induction). Ex. “the man is sitting in the chair” Analytic a posteriori are experience based propositions that can be shown to be true by their terms alone. Can be ignored. Hypothetical. Synthetic a posteriori are experience based propositions that can’t be shown to be true by their terms alone. “The man is sitting in a chair.” Empirical. Reality vs. Knowledge vs. Language: As noted above, all the definitions on this page speak to the relations of terms in propositions (the relations of subjects and predicates in statements). The point is that they can help us to better understand both the statement (the validity of the statement) and the truth behind a statement (the reality as it is, not just how we refer to it). For example, “all men are mortal” is a analytic a priori statement that tells us about the mortality of all men (where mortality is necessarily a property of any man; a tautological thing to state). The sentence is an analytic a priori, but there is no widget in reality called an analytic a priori and there is no widget called mortality. Instead, mortality is a quality of mortal beings and a priori is a logical category that helps us understand reality by understanding statements and language. When we speak, we necessarily speak in the language form, but despite this we are almost always referring to reality as understood by the human mind. These definitions help us to better understand reality, by examining the language form, to arrive at human knowledge as it relates to conception and understanding. Below are important definitions related to Kant’s terms to help the above make more sense. Concepts and Terms: To make a judgement, one must compare terms. To have a term, one must conceptualize something. To conceptualize something, one must have observed the attributes/properties of an object or imagined something. In general there are two types of concepts/terms: empirical (observed) and rational (imagined). Proposition: A logical judgement (or simply “a statement”) about two or more terms (a subject and a predicate; ex. “a bachelor is sitting in the chair” is a proposition or judgement about the subject, “a bachelor,” who is “sitting in the chair,” the predicate). In other words a proposition is a proposed logical judgement about at least two terms. Category: A class of things that share properties. TIP: When we say a priori we could be referring to a term/concept, a judgement/proposition, or a class of things. It depends on context. Space and time are a priori terms, judgements about space and time are a priori judgements, all terms and judgements about space and time are of the category a priori. Premisses and Conclusions: Two types of propositions; where a premise is a proposition that leads to a conclusion (another proposition). Empiricism: Knowledge through empirical evidence (information from the senses). Facts about the world. What we observe. We observe something and form a concept by observing its attributes. All real objects and real attributes and the real relations of objects are empirical. Rationalism: Knowledge through ideas (information originating in our minds). Facts about ideas. Everything that isn’t material, and is therefore formal, is rational. All argument involves rationalizing about rational and empirical concepts. Deduction: Deductive reasoning where one compares certain truths to draw out other certain truths. Induction: Inductive reasoning where one compares specifics facts and probable truths to draw out likely truths. Analytic proposition: A statement that is true by definition (can be proven true by analyzing the terms). Ex. “All bachelors are unmarried.” The bachelor is unmarried because he is a bachelor. “Being unmarried” is an attribute of “bachelor,” thus the statement is necessarily true by definition. Synthetic proposition: A statement that is not true by definition and requires observation or more information (cannot be proven true by analyzing the terms alone). Ex. “The man is sitting in a chair.” Nothing about sitting in a chair makes one a man, but we can look to see a man is sitting in the chair. The statement is not necessarily true by definition, it is contingent on more information (such as observing to see if it is true in this case). a priori proposition: a proposition whose justification does not rely upon experience. Ex. “1 + 2 = 3,” or “all bachelors are unmarried.” It stands to reason all bachelors are unmarried, but I can’t meet every bachelor to confirm this empirically (I have to confirm it rationally). Likewise, we know 1 +2 = 3 rationally, but numbers aren’t tangible material things we can confirm with our senses (we can’t look at see a 1, 2, or 3 directly). a posteriori proposition: a proposition whose justification does rely upon experience. Ex. “The man is sitting in a chair.” I can confirm the man is in the chair empirically, via my senses, by looking. Analytic a posteriori proportions: experience based propositions that can be shown to be true by their terms alone. This produces a contradiction and can be ignored. There are no Analytic a posteriori statements. Synthetic a posteriori proportions: experience based propositions that can’t be shown to be true by their terms alone. Ex. “The man is sitting in a chair.” I can confirm the man is sitting in the chair by looking. Analytic a priori proportions: propositions not based on experience that can be shown to be true by their terms alone. Ex. “All bachelors are unmarried.” By their nature, all bachelors are unmarried, although we can’t confirm it via direct experience. Synthetic a priori proportions: propositions not based on experience that can’t be shown to be true by their terms alone. Ex. “F=ma.” F=ma is necessarily true and not tautological, yet only indirect evidence can prove it (we can’t observe force, mass, and acceleration directly). TIP: Kant “proves” that synthetic a priori judgements are possible early on in his Critique, pointing to mathematics (ex. “7 + 5 =12”), geometry (“a straight line between two points is the shortest”), physics (“F=ma”), and metaphysics (“God gave men free-will”). The main question he then seeks to answer is, “how are a priori synthetic judgements possible?” To be clear, Kant doesn’t explicitly give all those examples, but they do fit the bill. Since metaphysics, in its dealing with freedom, God, and the will, deals with the unknowable a priori, the key to figuring out the limits of our knowledge and the usefulness of rationalism, are found in mathematics (including geometry) and physics. Here one should note that which Kant eludes to, that the physical, logical, ethical (metaphysics as it relates to human action or conduct), and metaphysical are all classes of phenomena with different properties (the physical, we can know with things like physics and observation, the logical with things like mathematics and logic, the ethical with things like social science and the law, the metaphysical with things like individual experience and imagination). To learn about the world, we need to consider classes rooted in the physical world, so the physics (which explains natural things) and mathematics (which can be used to explain natural things indirectly) are good places to look (as ethics involves free-will and metaphysics involves “that which we cannot know”). A necessary proposition (necessarily true): Any proposition which is necessarily true or necessarily false. Ex. “The white cat is white; or, the white cat is not black.” The white cat is by definition necessarily white. A contingent proposition (dependent on more information): Any proposition in which the truth of the proposition depends on more information. They are propositions that are neither “true under every possible valuation (i.e. tautologies)”, nor “false under every possible valuation (i.e. contradictions)”. Ex. “a black cat is sitting in the chair.” That statement is only true when a black cat is sitting in the chair, otherwise it is false. It is contingent on what the case is in this instance. Tautological proposition (necessarily true but redundant): That which must be true (or could be true) no matter what the circumstances are. Ex. “the black cat is black.” It is redundant (tautological) to say the black cat is black. TIP: It may be redundant to state a fact about a property of a system (such as the blackness of a black cat), but it is still a useful trick of analysis. So it isn’t useless, it is just tautological. “Possible” proposition (is true under certain circumstances): Are true or could have been true given certain circumstances. Ex. “x + y = 4.” That could be true, it depends on the values of x and y. With that in mind, let’s put the basics together in a table like we did above, but this time with more detail to better illustrate all this. What does “transcendental” mean in Kantian terms? An important but complex concept of Kant is the “transcendental.” Essentially each part of our discussion gets a transcendental, which generally describes where one category (like a priori) transcends into another (like a posteriori). Important for our conversation is the Transcendental Aesthetic, which describes the a priori of empirical things (like space, time, geometry). Here it describes not the metaphysical aspects of space and time, but the useful physic concepts used to predict behaviors of physical bodies that transcends the limits of pure rationalization and becomes useful knowledge about the world. Meanwhile, to flesh out the picture, Transcendental Logic describes the aspect of logic that relates to the empirical (like the categorizing of relations between objects). A synthetic a priori is of the transcendental aesthetic and we have categorized it using transcendental logic. Learn more Kant’s Transcendental. TIP: As you can see a from the above, some terms are very similar, this is because all these terms speak to different aspects of “what we can know.” All of logic is a bit like that, sometimes we are talking about the process of thought, sometimes about the product. Sometimes about a judgement, sometimes about a term. A justification that relies on experience (a posteriori), and a statement that is true on observation (synthetic) can use some of the same exact examples (as they are both speaking about an empirical judgement). Likewise, we can consider synthetic a priori terms, judgements, and categories (not just judgements/propositions/statements). Despite this, each term speaks to a different aspect of thought and has a slightly different meaning. In other words, many terms are similar, but they have specific meaning, and need to be considered on their own merit. Below is a table that illustrates the above terms as used by Immanuel Kant in his Critique of Pure Reason (his examination of the validity of using rationalized formal logic only to find useful truths about the world; as opposed to Hume’s idea that only direct empirical observations of the world detected via our senses produced useful truths; HINT: Kant ends up concluding Pure Reason is useful). In other words, Kant’s goal was to prove Hume’s idea that pure rationalization tells us nothing about the world wrong. He does this by proving the existence of a synthetic a priori (a statement not based on experience that can’t be shown to be true by its terms alone). The table below helps show what a synthetic a priori is, by showing how the analytic-synthetic and a priori-a posteriori relate. Ex. “All bachelors are unmarried.” We can’t personally ask every bachelor in the world if they are unmarried (does not rely on experience), but we know they are because a bachelor is by definition necessarily unmarried (the statement is tautological or redundant rationalized a priori). TIP: Pure “tautological” reason. Logical. Synthetic a priori are propositions not based on experience that can’t be shown to be true by their terms alone. TIP: F=ma is necessarily true and not tautological, yet only indirect evidence can prove it (we cannot observe force, mass, and acceleration acting on “bodies extended in space and time” directly). TIP: Although some statements can be contingent in this class. This class also contains statements that are necessarily true, but not tautological, and can’t be proven by direct empirical evidence (they instead require testing and indirect evidence to prove). A sort of mix of pure reason and empiricism that crosses Hume’s fork and to which induction and deduction apply. TIP: Transcendental (a mix of logic and empiricism). TIP: Produces a contradiction and can be ignored. There are no Analytic a posteriori statements. TIP: Some would argue that there are analytic a posteriori and they are needed for hypothetical judgements. Synthetic a posteriori are experience based propositions that can’t be shown to be true by their terms alone. Ex. “The man is sitting in a chair.” I can confirm the man is sitting in the chair by looking (of course the truth of this statement is “contingent” on the man actually being in the chair in this case; it is conditional). Notes: Like it is with deductive reasoning, any sort of analysis that produces only logical tautological truths isn’t that useful on its own. Hume and Kant essentially agree, a statement that can be proven true by analyzing its terms doesn’t tell us much about the world. Unlike with analytic reasoning, synthetic statements that cannot be proven true by analyzing their terms alone are actually very useful. Whether they are pure reason, pure empiricism, or a synthetic a priori mix, these facts about ideas and about the world can tell us a lot about the world and pair well with analytic truths. TIP: Speaking loosely, rationalism is related to deduction and empiricism is related to induction. Learn more about these reasoning types. Above we illustrated the basics of what you’ll learn from Kant directly if you read his Critique of Pure Reason from a modern perspective. The subject tells us about the works of the skeptic David Hume and the rationalist Immanuel Kant. This whole subject speaks to fundamental aspects of logic and reason as they apply to epistemology (specifically in terms of judgements/statements/propositions); so these terms don’t just help you understand Kant, they help you understand logic and reason as applied to any modern field. The underlying duality is between rationalization and empiricism. Since everything is an abstraction of that concept, what Kant and Hume are doing is essentially helping to guide our thinking through from that concept to the logic conclusions we can make based on that. The general take away is the synthetic a priori (a judgement that “crosses forks” successfully). The goal of “crossing” these forks is to show that pure rationalization can tell us something useful about the world, and that we should not, like Hume suggests, go throwing all our books on pure reason on the fire (although to be fair to Hume, I suspect he would have revised his theory or offered a counter-theory had he not passed away before Kant’s rebuttal was written; see the story of Kant and Hume). In his Critique of Pure Reason, Kant generally points to mathematics (ex. “7 + 5 =12”), geometry (“a straight line between two points is the shortest”), physics (“F=ma”), and metaphysics (“God gave men free-will”) to show “synthetic propositions a priori” possible. Of course space and time are complex concepts (terms), and not simple judgements using terms like “the man is on the chair,” and thus they are a little harder to explain (especially considering Kant’s sometimes unclear and dense writing). To simplify Kant’s ideas into my own words. “Synthetic propositions a priori” are a category of things (concepts and judgements) that are pure imagination, pure rationalization, and having no physical form, but also exist as truths that tell us about the world. A straight line doesn’t exist in real life, nor does a perfect circle, but yet geometry does. Is geometry just reasoning by analogy? Perhaps. But the result is none-the-less useful knowledge about the world. Likewise, time and space aren’t any more material objects than a prefect circle (although they do have different qualities), but they are none-the-less real. Here we can note that judgements that use terms from this category of synthetic a priori (for example, judgements about the world that use terms related to geometry or space and time) are synthetic a priori judgements. Any Synthetic a priori judgement that is valid then is also an example of “crossing forks” (the synthetic from the empirical fork is mixed with the a priori from the rational fork; see Hume’s fork for the metaphor). Synthetic a priori judgements include statements like “all phenomena in general, that is, all objects of the senses, are in time and stand necessarily in relations of time” and equations like Newton’s F=ma or Einstein’s E=mc2 are examples of synthetic a priori judgements. All these judgements are Pure Reason (Pure Logic; a Priori), despite being both necessarily true (valid statements / very strong theories), and they are not tautological (not purely analytic and redundant). These synthetic a priori judgements tell us about the real world… in theory at least. To confirm these tell us about the real world it helps to understand that we can use judgements like this to make predictions about phenomena. In this respect, we can’t confirm that synthetic a priori judgements tell us anything about the world until we test and confirm them via experiment and actually physically “cross forks” (we have to not only create a “Synthetic a priori,” but prove it is true empirically via testing to show there is merit in all this rationalizing about synthetic a priori). And of course, equations like F=ma do just that. Even though we can’t reach out and touch their forms directly, we confirm spacetime, geometry, the equations of physics, and other valid synthetic a priori judgements “are true,” in that they can help us to predict what we will observe empirically with perfect accuracy (and thus we can treat them as scientific theories and facts). …and to end, this explains why the necessary-contingent distinction is so important. Synthetic a priori judgements include pure metaphysical statements like “all men have free-will” and physics judgements like “F=ma.” Both are contingent on data, but where “F=ma” can be proven with testing (and can then be considered a necessarily true rule), “all men have free-will” is at best only partially unobscured via social science and metaphysical thinking. Kant helps us to see that while we can have useful a priori knowledge about the world, the class of things that is metaphysics is destined to remain at least partly unknowable. However, Kant also helps us to see that anything that speaks to a phenomena in the real world can be better understood through rationalism. – Kant on SECTION II. Of Time. TIP: Just to phrase the bit on Hume’s fork one last time so it is clear: Kant successfully synthesizes Hume’s ideas with his own in his masterwork a Critique of Pure Reason, thus “crossing Hume’s fork,” by saying (paraphrasing), “although all knowledge begins with the senses, we can use our experiences to inform our reason, and vice versa; We can’t rely on our senses alone, but nor can we rely on pure rationalization.” Thus we can say, Kant “crosses Hume’s fork” by proving that we can create a confirmable [via testing] “synthetic” “a priori,” a proposition that is “necessarily” true and not dependent on itself, yet can’t be proven via direct empirical evidence (it can only be proven indirectly). 1. David Hume’s Fork and Immanuel Kant’s Synthetic A Priori. “Hume’s Fork” is a concept laid out by Kant to refute Hume and labeled by later philosophers. Critique of Pure Reason. Wikipedia.